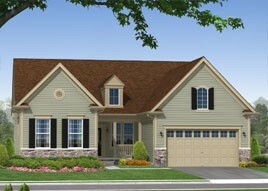 THE STEWART II - Starting from $352,900 3 - 5 Bedrooms / 2 - 4 Bathrooms / 2,224 - 4,190 sq. ft. The NEW Stewart II plan offers all of the great features of the original Stewart, with a few key variations. The staircase has moved locations and we have introduced a new space-saving split staircase design, allowing for a more spacious master suite, which now includes two walk-in closets and a more luxurious master bath. Looking for even more luxury? The master includes an option for a 2' extension in the bedroom and a brand new deluxe bathroom layout complete with extended vanity and spa shower. Outside of the master suite, the dining space has been redesigned to reflect a more traditional format, with full & half walls and columns enclosing the space. For those who wish to create a completely enclosed space, an option to transform the dining room into a den space with French doors is available. In the kitchen, 2’ of extra cabinetry and a larger island will appeal to culinary enthusiasts and optional 2’ extensions in the breakfast area and great room will allow for even more open space for these entertaining spaces surrounding the kitchen. The Stewart II maintains the loft option from the original Stewart, but the open loft area has been transformed into a squarer configuration. Additionally, the optional bathroom now can be accessed from the loft space without going through the optional bedroom. Square footage from 2,224 to 4,190. Starting from $352,900.